A dumb action thriller, Acts Of Violence is underproduced, badly written and blandly executed. In Cleveland, Deklan MacGregor (Cole Hauser) is an army veteran suffering from post-traumatic stress disorder. 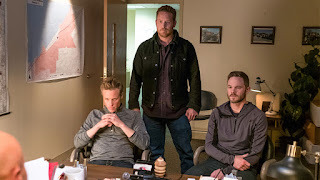 His brothers Brandon (Shawn Ashmore) and Roman MacGregor (Ashton Holmes) are better adjusted, with Brandon married to Jessa (Tiffany Brouwer) and Roman engaged to Mia (Melissa Bolona). When Mia goes out to party with her girlfriends, she insults goons working for human trafficker Max (Mike Epps). Soon Mia is abducted and held in captivity. Deklan rallies his brothers to mount a paramilitary rescue operation, while detectives James Avery (Bruce Willis) and Brooke Baker (Sophia Bush) try to keep up with the escalating violence. Directed by Brett Donowho, Acts Of Violence is a soulless and witless grade Z flick, stultifyingly familiar and routine. The production values are at the basic television level, with the film apparently shot in 15 days, and Willis on set for a grand total of one day. Despite the obvious lack of polish, Donowho deserves some credit for delivering coherent, jerk-free action sequences, amidst a ridiculous plot full of holes, a complete absence of character depth, wooden acting, and stock dialogue. The attempts to introduce familial ties as an emotional anchor flounder on the rocks of insincerity, while the PTSD theme is introduced in the first scene and then essentially ignored. While cheap action films will always be around, it is sad to see the once mighty Bruce Willis reduced to this.